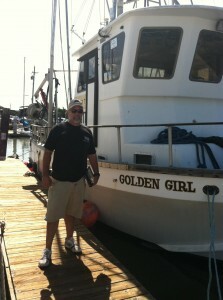 Dan Durbin, a former recreational fisherman and local business owner from San Jose, is also living his dream. With the help of a $154,000 loan, Dan purchased his first commercial fishing boat, the F/V Golden Girl, along with permits to fish for crab and salmon. Both Don and Dan’s CFF loans coincide with the transition to a crab pot limit program. Under the new pot limit, the maximum number of pots that can be fished by each vessel is set at between 175 and 500. Both Don and Dan have 250-pot limits. This management change brings California’s regulations on par with Oregon and Washington, leveling the playing field between the three states where there is often cross-over in fishing effort. The hope is that the new regulation will reduce fishing capacity, decrease competition on the water, increase safety and reduce the amount of lost gear in the sea. This is a pivotal time for California crab. While questions still remain regarding the effectiveness of the new regulations’ ability to slow down derby fishing we’re happy that the fishery is taking the necessary steps toward sustainability by addressing the over-capacity and excessive fishing effort it has faced for so long. We are also thrilled to see this all stem from a collaborative effort between fishermen and policymakers and are even more thrilled to help fishermen transition to pot limits through our CFF loans. This entry was posted in Pacific and tagged California Fisheries Fund, dungeness crab, Fishermen. Bookmark the permalink. Both comments and trackbacks are currently closed.